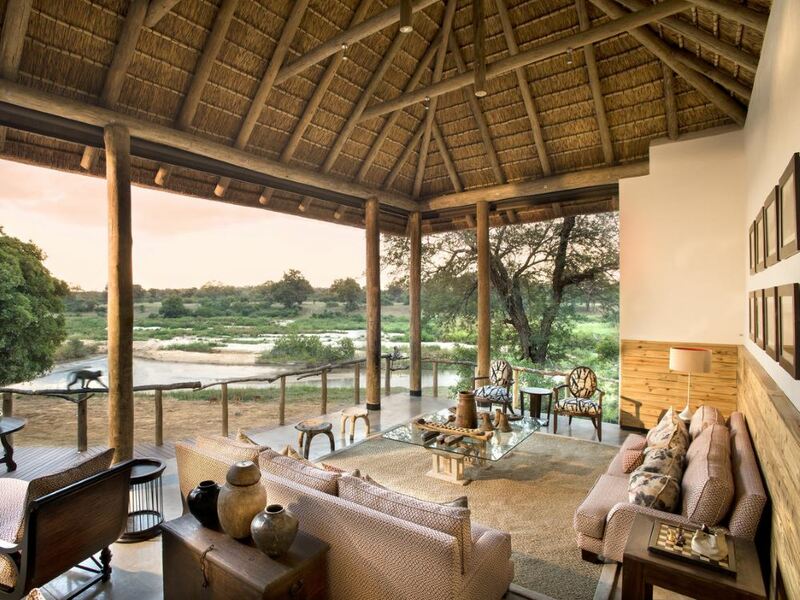 Set on the bank of the Sand River – makes game viewing an all-day event from the comfort of your private deck and plunge pool! 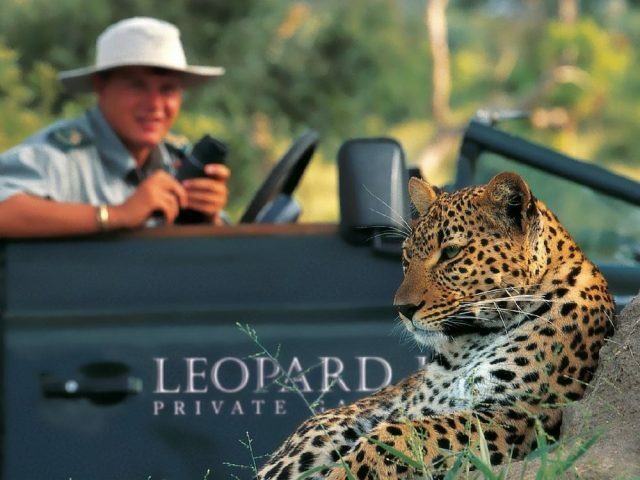 In the prestigious Sabi Sand Reserve – home to the best sightings of leopard in the world! 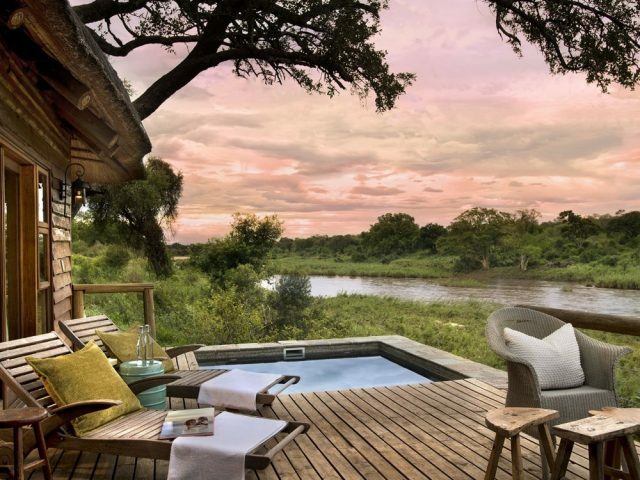 Outdoor showers and private plunge pools that have dramatic riverside views – watch the animals come down to the river whilst you do a spot of wallowing yourself! Phew, not much really! Like most of the Sabi Sands lodges it doesn’t come cheap, but then again game viewing as good as this is worth every penny! watch the ellies cavort in the river below whilst you indulge in your own outdoor shower or lounge in your private plunge pool - just as refreshing but without the mud! Adjacent to the world renowned Kruger National Park, the Sabi Sand Game Reserve covers 65 000 hectares and is part of a conservation area that covers more than 2 million hectares in all (that’s bigger than some countries) It's famed for its intimate wildlife encounters and home to a host of animals - including all the Big Five but particularly leopard. In fact the Sabi Sands offers unarguably the finest leopard sightings in the world! Within the shade of a grove of ebony trees, Dulini River Lodge (previously known as Exeter River Lodge) is a luxurious haven offering spectacular game viewing opportunities. The lodge consists of just eight air-conditioned luxurious suites, each of them enjoying dramatic close up views of the river. Chances are you’ll be watching the ellies cavort in the river below whilst you indulge in your own outdoor shower or lounge in your private plunge pool - just as refreshing but without the mud! In spite of the suggestion of name of the seasonal Sand River on which it is located, there’s nothing barren about the location of this warm and welcoming lodge. It’s set in a leafy, evergreen thicket on the river banks. 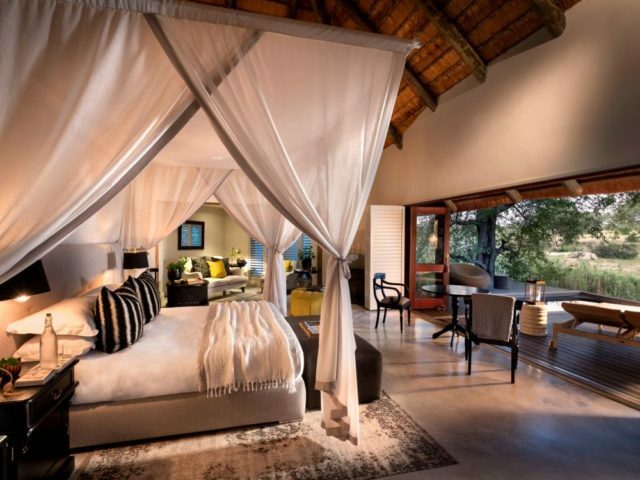 Each suite is well designed and features generous large spaces under the lovely open thatched roofs, with elegant en-suite bathrooms including lovely deep bathtubs and glass indoor and outdoor showers. Private plunge pools are surrounded by spacious decks that overlook the river where all sorts of creatures come to drink and where you may spot marauding monkeys stealing fruit – who needs TV when you have this sort of entertainment right on your doorstep! Plush loungers beckon you from your room out onto the private deck of your suite, inviting you to savour the sights and sounds of incredible wild life - warm afternoons can be spent cooling off in your private plunge pool and simply soaking up the beautiful scenery. Two daily game drives traverse over an area of 10 000 hectares using open 4x4 vehicles and strict vehicle limits at animal sighting ensure the exclusivity of your game viewing experience. Off-road driving ensures that you have the best possible view of any exceptional sighting and superb photographic opportunities. At Dulini River Lodge, the highly trained ranger and Shangaan tracker share their knowledge and understanding of the bush and its inhabitants with you. 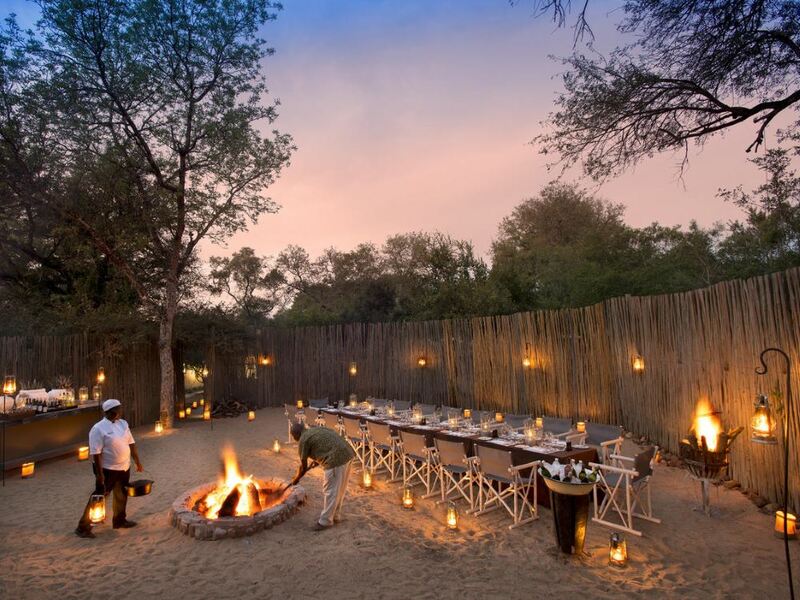 Track the Big Five, as well as endangered species such as wild dog and cheetah or take a drive past marula trees renowned for its abundant summer crop of juicy fruit to watch as elephants or troop of baboons devour this favoured delicacy. Whilst there’s a rich variety of game, from antelope such as duiker, kudu, bushbuck and nyala, to larger specimens like elephant and giraffe, it's the leopard that is the real star of the show here. The Sabi Sands is the best place to view this shy and elusive animal, normally the most solitary of the African cats. Here they have become so comfortable around vehicles that you’re pretty much guaranteed wonderful sightings of this stunning cat! In-between game drives, you may decide to take an interpretive bush walk with an armed ranger and take in the intimate details of your surroundings, from the intricate patterns of a spider's web to the prolific birdlife. Alternatively why not choose to follow the example of the hippo wallowing in the river and seek refuge from the heat of the afternoon in your private plunge pool re-living the excitement of your game drive or simply veg with a good book in the cool interior of your spacious suite before a restful siesta where the last sound you hear as you drift off to sleep is the birds chattering away in the surrounding trees!